All incense should be stored in a cool / dry place. Never store incense in a room with heaters / stoves and other appliances which give off heat. The incense which is a mixture of pure Olibanum Resin (Frankincense) and Essential Oils / Aromas may react quickly to changes in temperature especially if it has not cured / hardened properly. The type of aroma also has a great effect on how "hard" the incense becomes and how long it takes to "cure" or dry. For best results during burning, the incense should be hard. Gummy incense which needs to cure will burn poorly, releasing its aroma quickly. Generally, the harder the incense is the better it burns. Storing the incense within its packaging in a cool place will ensure the incense hardens and burns correctly. 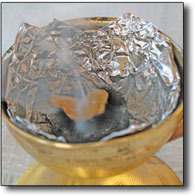 If the proper techniques are used, the incense should burn slowly, releasing all of its aroma and leave very little residue on the coal. 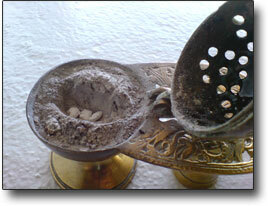 In general, incense should not be added to newly lit coal. If incense starts to "boil", deforming quickly and smoking violently (smoke is released straight up), then the coal is generally too hot or the incense still needs time to cure properly. The incense should release the aroma slowly, the smoke rising gently from side to side. Do not push the incense into the coal unless it is cold on top. Moving the censor will also add heat to the coal which in turn will slowly burn the incense. The incense generally should not release aroma as soon as it is placed on the coal. The slower the release of aroma, the better the outcome. Light the "quick lighting" coal. Leave the lit coal sit until it slightly greys on top (a minute or two depending on size - wait longer for larger coals, less for smaller coals). Never add incense to freshly lit coal (ie when it is still red hot on top). This will "burn" the incense, releasing all the aroma at once and producing a burning effect at the end of incensing. 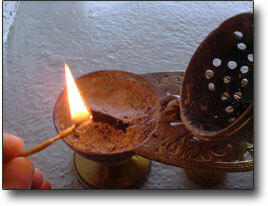 Once the coal has "greyed" on top, place the incense lightly on the coal - never push incense into the coal. This will slowly release the aroma and have a lasting effect during the incensing. This also negates the burning effect since the incense burns off slowly. The "cooler" the coal is the longer the incense will last. Never add incense to hot coal. If one is in a rush to incense (eg during entrance of a church service) then place the incense on the side of a newly lit coal. 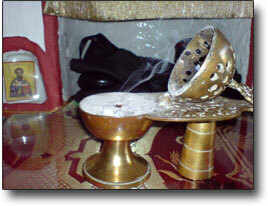 Again, this will allow the incense to release its aroma much slower than on top and negate the burning effect. 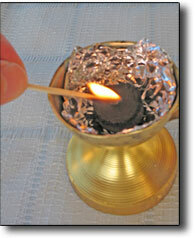 Another method is to place the incense in the censor and then place the lit charcoal on top! Most monasteries tend to use ground coal instead of quick lighting coals. Ground coal is considered a much better and more traditional form for incensing. It does not "explode" like the quick lighting coal, it lights slower, lasts much longer and does not smell or blacken church walls / icons. Open a small hole with a spoon in the existing ash. Cover the ground coal with the ash so that only a small portion of ground coal protrudes from the surface for lighting. 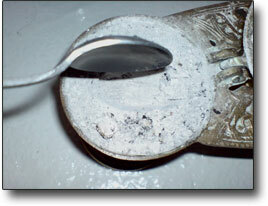 If covered well, the 2 teaspoons of coal will last for a short liturgy. Light the coal and wait until it greys on top. 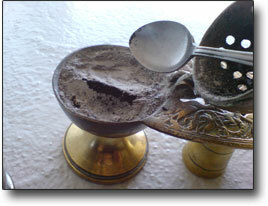 Once it greys on top, place the incense carefully on the ground coal so that it does not attract the bulk of the heat. Using this method will slowly release the aroma as shown in the photos. If the incense starts to "boil", deforming quickly and smoking violently (smoke is released straight up), then the coal is too hot. The incense should release the aroma slowly, the smoke rising gently from side to side. Do not push the incense into the coal unless it is cold on top. 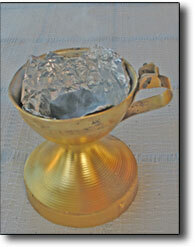 Moving the censor will also add heat to the coal which in turn will slowly burn the incense. 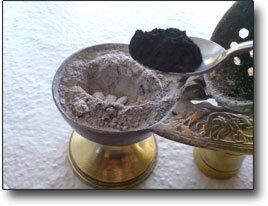 The incense generally shouldnt release aroma as soon as it is placed on the coal. For better results with ground coal, place the incense in the incense holder and place the ground / unburnt coal on top of the incense. The incense will burn while the ground coal lights. This produces an excellent and very slow release of the aroma and negates much of the burnt effect which is common with some incense especially when it is burns on hot coals. What happens if the incense is gummy or sticks together? On occasions incense which has not cured properly may stick together. This could happen especially during summer months with incense which has not cured and which has been left in a vehicle in the summer heat. Incense which has not cured properly is more likely to stick together if it is left in a very warm area. If for whatever reason this happens do not try to pick the pieces apart and definitely do not throw the incense away. Placing the incense in the deep freeze/ freezer overnight will harden it enough to simply break the pieces apart the next day. Return to our main incense page. 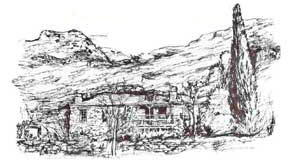 All proceeds will go to the renovation of the 1000 year old Athonite hermitage of St Eleftherios - Vouleftiria at St Anne's Scete.